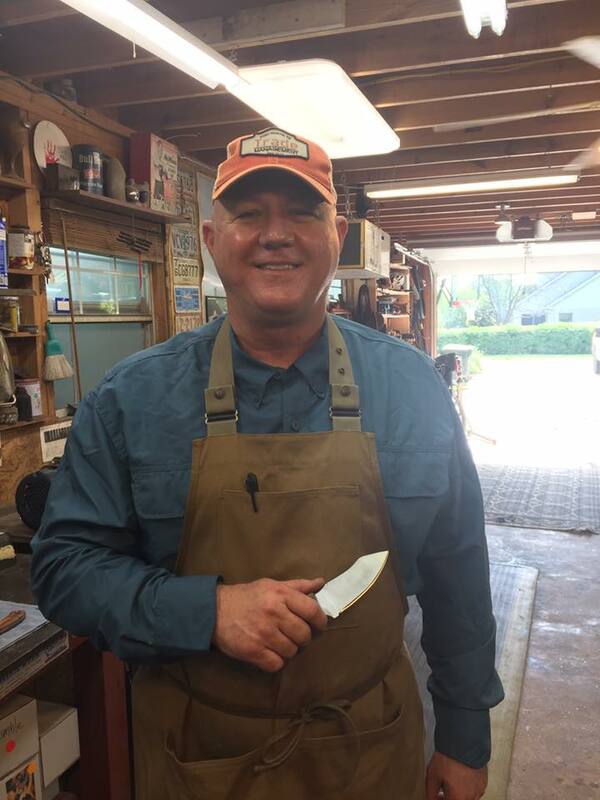 We are currently booking students for the knife class! The class is now being held at our main location in Belton, TX. 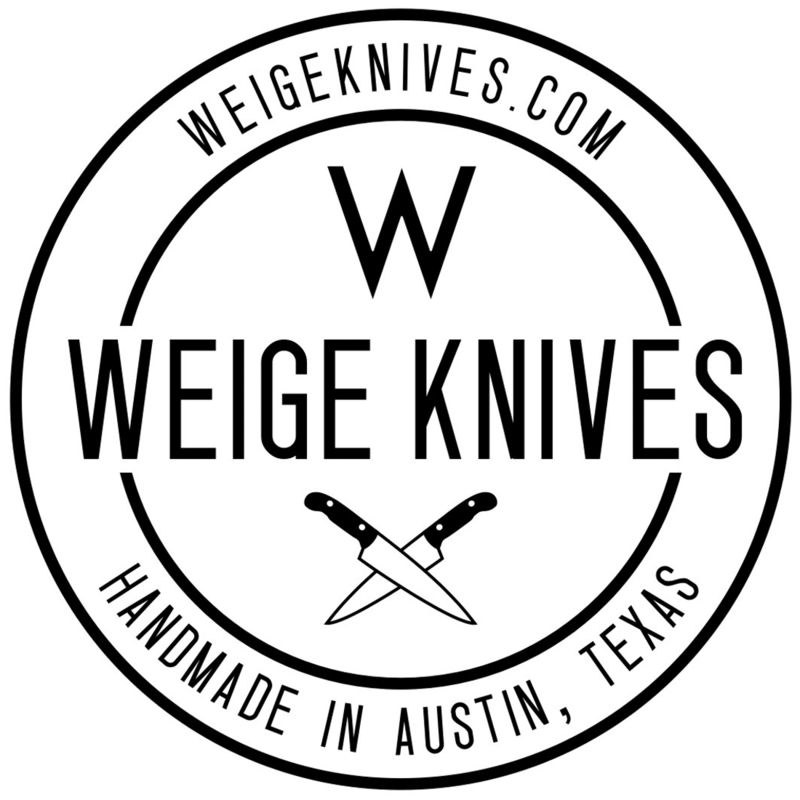 We’ve had a lot of response to our new Knife Class here in Central Texas. There’s a small blurb about it on our Services page, but I’m going to put more info about it here. You’ll spend 3 days learning how to make a stock removal knife using the flat grind method. We do not forge here because we focus on stainless steel. The class is 1 student per class and is taught by Travis Weige. You will build most of the knife, 75-90% or so and Travis will help only if needed. Travis will build the same knife as you and it will work in a “follow the leader” method. 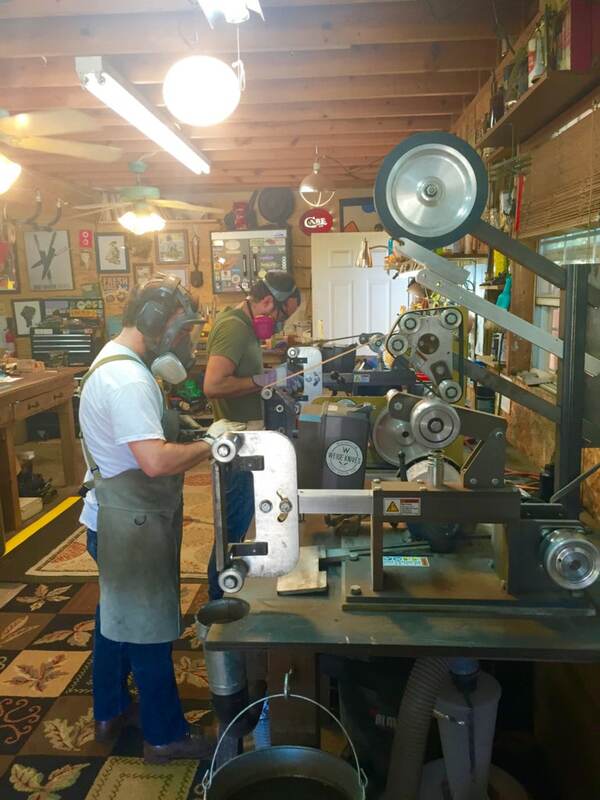 Meaning Travis will perform a step in the knife making process and you will watch. Then you will repeat what you saw and he will watch you. For out of town or state students we can combine 3 days into 2 to make it easier to access. It’s just a lot of info to absorb, but it’s possible. About the knife we’ll make: We produce a knife of your design under 12″ total. We’ll make either a kitchen or outdoors knife within reason. We won’t do any sort of fantasy knife, sword, dagger, throwing knife, etc. but instead something that is usable as our focus is based on building a functional and long lasting tool. The knife will be made in 440c stainless steel. You can choose the handle, liner and pins from our current inventory. We have hundreds of options in local and exotic woods. We also have micarta, G10 and other synthetics. 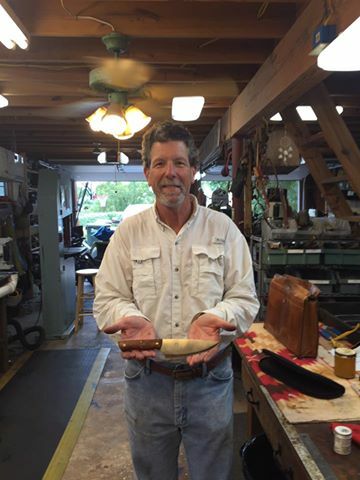 We do not do bolsters in this class or get into advanced knife making like using damascus. 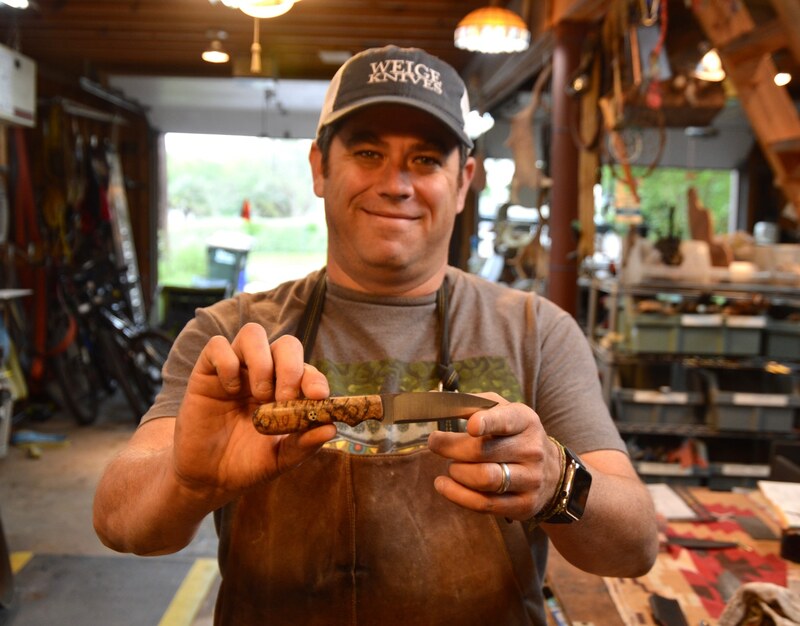 The goal of the class is to teach you the process of knife making, what tools are needed and for you to leave w/ a beautiful finished and functioning blade that you can be proud of. We start by drawing the knife on graph paper or you can bring the design along with you. Once the design is final we’ll cut out the design and draw it onto a billet of steel. We’ll cut out the knife on a steel cutting bandsaw. We’ll then deburr the knife on the grinder and then drill the holes into the tang where the pins will go. We’ll then put the initial bevel on the blade and then put the knife into the heat treat kiln. 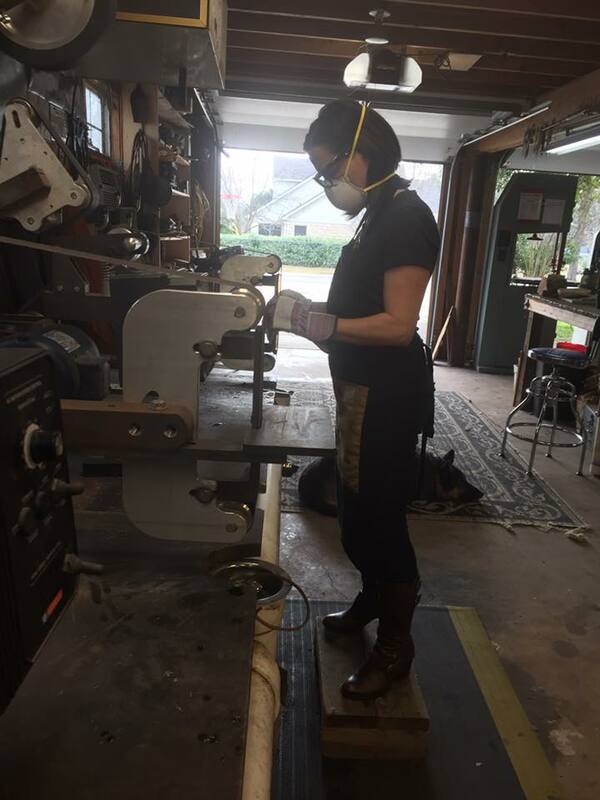 We’ll also prepare you knife handle materials, get it into the vice so it can dry overnight. We start by testing your knife on the Rockwell Hardness tester to make sure our heat treat worked correctly. You’ll then put the finishing grind on your knife, establish the initial edge and then put the handle material onto the knife. We’ll then put the knife into the vice and let it dry over night. We’ll remove the knife and you’ll work on your handle for the day. You’ll use the slack belt to shape and form the handle to fit your hand. Once it’s complete we’ll oil the handle and then put the final edge onto the knife. Each day will take 2-4 hours of work depending on your skill level. We do not offer sleeping accommodations if you are coming from out of town. Mask, gloves and apron if you have them. If not, we can provide them. You’ll also need to sign a liability waiver before you can use the machines. We can send you the form to look over before hand, but it must be signed in person upon arrival. Balance of school tuition is due on Day 1 of the class. A $100 non-refundable deposit is required to secure your spot. There are many more things that will happen in the class, but this is a general overview so you know what to expect when you get here.